I think I need to start wearing more grown-up clothes. At the airport this morning, I had to go to the office to claim my luggage and the clerk behind the counter asked me if I was a "UM." I blame my cartoon Harajuku Lovers purse. No one over the age of 14 should be carrying it, I know. But it has a nifty whistle! Maybe it's also related to the fact that I do feel like an unaccompanied minor a lot of the time. I will be the world's most overgrown unaccompanied minor. It's fine. 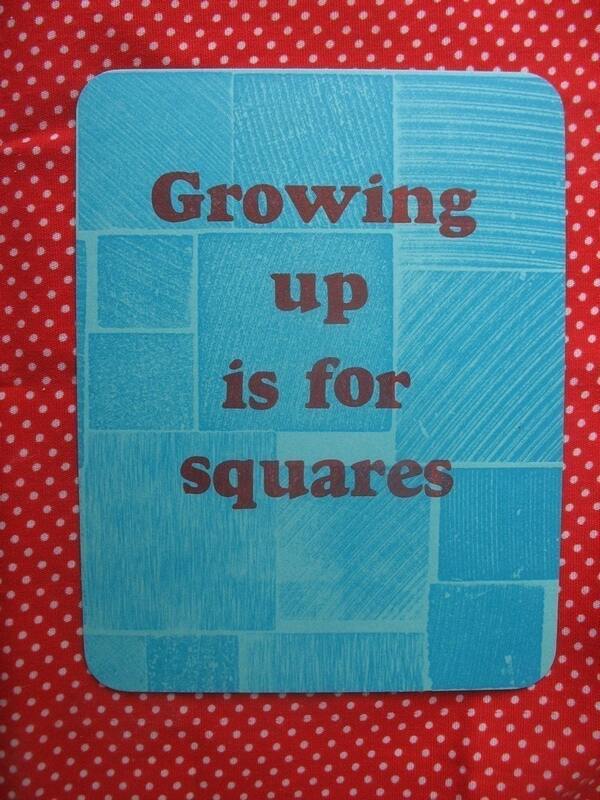 I recently bought a postcard that says "Growing Up is For Squares" and then there are pictures of squares. That is my motto for the moment. October 20, 2009 by Adele Chapin.